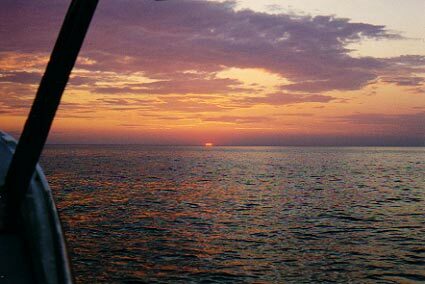 The Whaleback lighthouse at the harbor entrance at about 5 a.m.
Around 5:30 a.m. Sunrise on open water. When the hauler starts, traps are brought up and layed on the rail where they are cleaned out. 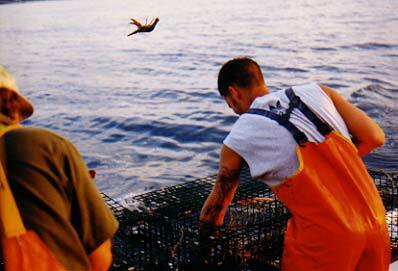 Potential keepers are placed in a tote while shorts are tossed over the side to be caught another day. 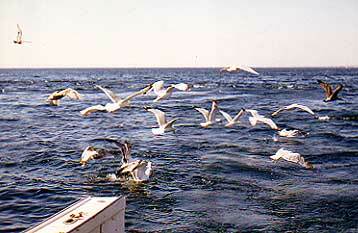 The boat is frequently accompanied by a squabble of gulls. They gather to grab old bait that is emptied from the bait bags of hauled traps. They seem to appear as soon as they hear the wail of line in the hauler. Potential keepers are measured. 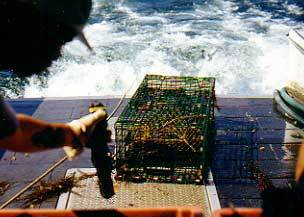 Legals are banded and dropped into the live-tank while the traps are baited again and the captain resets the trap line.